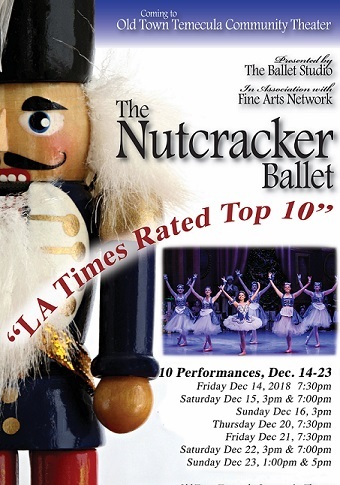 Having starred in the award-winning feature documentary film, The Making of The Nutcracker at the Temecula Valley International Film Festival, The Ballet Studio offers their renowned version of the most-performed ballet in the world. This enchanting tale of a girl’s first love, a Rat King, a Nutcracker, and a Prince, is set to Tchaikovsky's classic score. Experience the magic in Clara-Marie’s journey of joy, fear, her first love and with that… excitement, trepidation and fantasy! Recognized in the LA Times as one of the best to see in Southern California and rated tops in KIDS GUIDE MAGAZINE. This production is the perfect holiday outing for the whole family!